Children are close to our heart! At New Life Brace and Limb pediatric is an area of special focus. Pediatric Prosthetics and Orthotics require skill, training and dedication - New Life fulfills them all. Bob Draeger, CPO, LPO, Cped has extensive experience in Pediatric Orthotics. Draeger leads our experienced, attentive and dedicated team as our Pediatric Prosthetic and Orthotic Specialist who has been serving children at UTMB children's hospital for over 25 years. We perform periodic checkups for children fitted with Orthotics to ensure their devices continue to fit and function well. We provide state-of-the-art rehabilitative orthotic devices, quality restorative orthotic care and the highest level of patient-focused service. We strive to improve the functional outcome of every patient. Our custom fabrication and adjustment facilities ensure our patients are served better & faster whenever an off the shelf device doesn't fulfill their needs. We use cutting-edge technology to custom design and custom fabricate a wide range of orthotic devices to correct deformities or improve the function of a weakened extremity. Newlife Brace & Limb provides a specialized approach for prosthetic care for children, we understand how important the care of their needs during their growing years. Children with their rapid growth, will require frequent office visits and more careful observation of their progress. Pediatric patients between the ages 1-18 years will require a new socket and other prosthetic modifications at least yearly and should be evaluated by their prosthetist every six months. At New Life our Pediatric Prosthetist, we specialized in Upper and lower limb/extremity prosthetics. Specialized prosthetic activity-specific prosthesis devices. Adolescent Idiopathic Scoliosis is a curvature of the Spine that affects children during adolescent growth. New Life specializes in Scoliosis Bracing and provide bracing options to treat and manage the spine. Orthotic devices pave the road towards strength, balance, comfort and independence. According to estimates, about two-thirds of children with Cerebral Palsy have the ability to walk and ambulate. But because of the nature of Cerebral Palsy – and its effect on the muscles, joints, and patterns of motion – establishing a gait that is meaningful can be a challenge. When an orthotic device is a successful part of treatment, it should help children establish normal patterns of joint and muscle motion. These are more commonly referred to as inserts that are placed in shoes to shift the weight of the feet and legs and bring balance, relieve shock, and minimize stress. They can be rigid or soft, and they can be custom-made or fitted. Also, the orthotic device can come in the form of an actual shoe. Sometimes referred to as AFOs or foot drop braces, these semi-rigid L-shaped braces stabilize both the foot and ankle to bring muscles and joints into alignment. The braces extend up the calf, and are typically made of metal or hard plastic; they have straps that can connect together to hold the device in place, and bring stability to foot, ankle and lower leg by immobilizing it. These are also used to correct foot drop. AFOs account for 26 percent of all orthotics used in the United States. AFOs include anti-Talus AFOs, Rigid AFOs, Tamarack Flexure Joint AFOs, Solid AFOs, Spiral AFOs, Hemispiral AFOs, Hinged AFOs, Tone-Reducing AFOs, and Posterior Leaf Spring AFOs. Called HKAFOs, these devices use bands, belts, pelvic girdles and knee-ankle orthotics to help position a person upright while centering the knee joint. Called KAFOs, these devices stabilize the knee, ankle and foot, allowing for proper function and movement. KAFOs are equipped with mechanically- or electrically-controlled hinges. They are useful when a child has limited movement in his or her legs so they can help when learning to walk. A brace that is worn to support and align the knee; it extends from above the knee to below it. 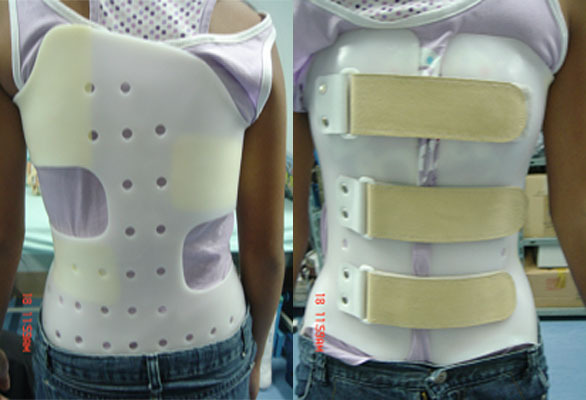 If a child needs additional support or alignment in his or her upper torso, a spinal orthotic device can help a child sit up or stand; it is particularly useful if a child has limited trunk control. Sometimes called THKAFOs, are HKAFOs with spinal orthosis for control over trunk motion and spine alignment, most often used by individuals with paraplegia. This brace is rigid and has knee hinges; it is used mostly for people who have knee injuries.